I work with college students everyday, and we often chat about making the transition from College to career. This includes conversations around finding their first professional job, expectations they have of the employer, and how to manage personal and professional lives. A lot of them talk about wanting to enjoy the work that they do, work for a company they believe in, have the freedom to work from home, and belong to a collaborative team environment where guidance is nearby, but not overbearing. When we get to discussing the intersection of their social media accounts and their professional careers, they often see it as their “right” to use their own social media accounts at work. The attitude seems to be “if the job gets done, what’s the big deal if I spend 15 minutes on Facebook while having my 10:30 a.m. coffee?” And I would have to agree. 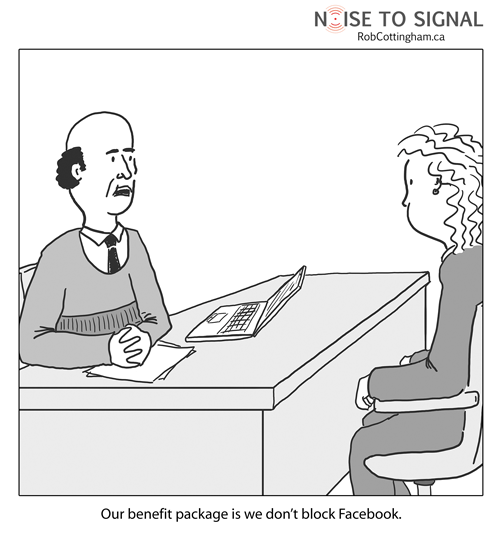 If the job gets done, I have no problem with office Facebooking. It’s also quite interesting that when I ask these same students if they would be OK doing some work at home if they couldn’t get it done in the 9-5 office hours they are paid to be there, they say they would…without hesitation. The infographic below from OnlineCollegeCourses.com shares some findings that seem to support the anecdotal evidence I’ve seen in the attitudes of college students as they transform into young professionals. Big thanks to davidhallsocialmedia.com reader Muhammad Saleem (@msaleem) for sending me this infographic. Today is the unofficial end of summer in Canada, and many places around the world, as students from kindergarden to post-secondary return to school for another year of study. Social media is often demonized as a classroom (and workplace) distraction that negatively affects students. Early research from the Whittmore School of Business and Economics at the University of New Hampshire shows that this isn’t the case at all. It turns out that social media doesn’t mean lower grades; it actually helps create the environment that encourages discussion and knowledge transfer, ultimately resulting in higher grades for students who engage in social media the most. 1. Better grades: It is interesting to note that this research suggests that better grades aren’t simply tied to whether you use social media or not, but it found that the more hours a student spends using social media the more likely it would be that they had higher grades. 2. Increase of peer-to-peer learning: When teachers integrate social media in the classroom, this research shows learning through discussion increases and students achieve higher grades. Often, this can be as simple as a Facebook page where students can discuss course content and assignments, Twitter accounts to send students reminders, or even YouTube videos of past lectures. 3. Use for education: After social media’s social and entertainment value, this research indicates that the third most common thing students use social media for is education. Have your grades changed since you began using social media? 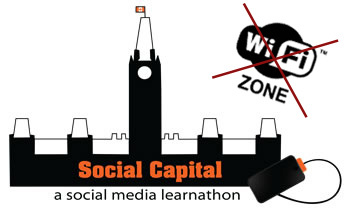 With great anticipation, the first annual Social Capital Conference was held in Ottawa last weekend. The sold-out event gathered 150+ of the region’s top thinkers, social networking professionals, and most enthusiastic social media beginners to discuss issues divided into three streams: fundamental, advanced, and business. I spent all day in the business stream, but I also heard great things from each of the other sessions. Now onto some of the awesomeness. It truly was a successful event. A great crowd, great conversations, some interesting speakers. The part of the day I enjoyed the most was the 90-minute session of organized-chaos where attendees were encouraged to roam freely between about a dozen facilitated conversations about podcasting, SEO, social coupons, risk management, WordPress, Twitter, community management, and so on. Best takeaways. First, my conversation with Vivian Cheng, Owner of Blend Creations. She was discussing how she uses social media for her business, and her experience with community buying services (or social coupons). The plan is to interview her for a later post on community buying from a (small) business perspective. Second was a conversation with @Kmarketing, facilitated by @benkmyers, about SEO. It was less of a conversation, and more of me asking a few questions and trying to absorb all the details and knowledge spilling out. If you want to chat about SEO and analytics, talk to these guys. Now the Oddities. Before I get into this, I want to be clear that I’m pointing out the challenges in the interest of improving an already great event for next year, not to be insulting. A few logistical snags were the only thing holding this back from being the one of the best conferences I have been to: long lunch lines, running out of food, not enough conference “gift bags.” For some people lunch consisted of a half of an egg salad sandwich and a diet coke; not the best value for a $75 ticket. 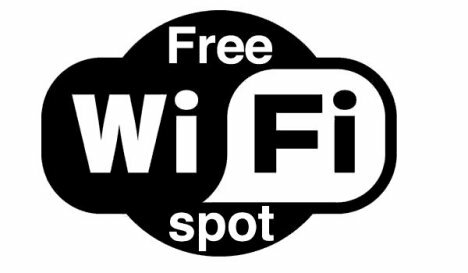 This was all minor stuff that the content of the conference helped you forget about, but the one thing that was really a pain point was the lack of WiFi service. Yup, that’s right, it was a social media conference, in the Nation’s Capital, and there was no Wifi. It was so important to the function and optics of the event. I even asked about WiFi service the week before the event, and I was assured it would be there…and it wasn’t – #fail. Also, no tweet wall was used to help people keep track of the conversations: that’s another easy one to fix for next year too –visible tweets is a good option. Overall, it was a solid conference, and I hope they do it again in 2012, if not sooner. It’s always great to designate at least one day a year to meet some of your “online friends” IRL. The Social Media Yearbook – If social media was a school, how would each social network fit in? I came across this fun little infographic from FlowTown a few months ago, and I decided to hold on to it until we were in the full-swing of convocation season at colleges, universities, and high-schools around the country. Since today marks the first of five graduation ceremonies at Algonquin College (my alma mater and current employer), I thought it would be the perfect time to share.